“Goliath” is made up of numerous vignettes, some only a few pages long, that methodically build a picture of Israel, like pieces fit into a puzzle. It is in the details that Israel’s reality is exposed. The Israeli army, Blumenthal points out in his first chapter, “To the Slaughter,” employs a mathematical formula to limit outside food deliveries to Gaza to keep the caloric levels of the 1.5 million Palestinians trapped inside its open air prison just above starvation; a government official later denied that he had joked in a meeting that the practice is “like an appointment with a dietician.” The saturation, 22-day bombing of Gaza that began on Dec. 27, 2008, led by 60 F-16 fighter jets, instantly killed 240 Palestinians, including scores of children. Israel’s leading liberal intellectuals, including the writers Amos Oz, A.B. Yehoshua and David Grossman*, blithely supported the wholesale murder of Palestinian civilians. And while Israelis blocked reporters from entering the coastal Gaza Strip—forcing them to watch distant explosions from Israel’s Parash Hill, which some reporters nicknamed “the Hill of Shame”—the army and air force carried out atrocity after atrocity, day after day, crimes that were uncovered only after the attack was over and the press blockade lifted. This massive aerial and ground assault against a defenseless civilian population that is surrounded by the Israeli army, a population without an organized military, air force, air defenses, navy, heavy artillery or mechanized units, caused barely a ripple of protest inside Israel from the left or the right. It was part of the ongoing business of slaughtering the other. 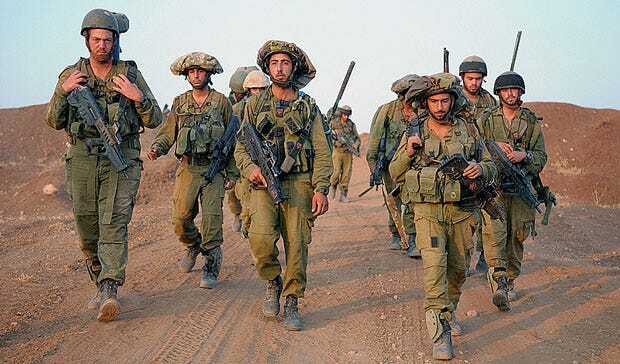 The IDF on manoeuvres; to many, inside and outside Israel, the IDF is the primary symbol of their ideal of the country – egalitarian, resolute in the defence of Israel. Critics are rare and rarely listened to. *All three supported a retaliatory attack on Gaza but quickly called for a ceasefire before the ground troops went in. The formal IDF offensive began on December 27th, 2008. “Oz, A.B. Yehoshua quoted in two Italian papers saying Hamas to blame, but ceasefire must be reached.” Ha’aretz, December 30, 2008. Chris Hedges was part of the team of reporters at The New York Times awarded a Pulitzer Prize in 2002 for the paper’s coverage of global terrorism. He also received the Amnesty International Global Award for Human Rights Journalism in 2002. The Los Angeles Press Club honoured Hedges’ original columns in Truthdig by naming the author the Online Journalist of the Year in 2009 and again in 2011. The LAPC also granted him the Best Online Column award in 2010 for his Truthdig essay “One Day We’ll All Be Terrorists”. Hedges is a senior fellow at The Nation Institute in New York City. He has taught at Columbia University, New York University, Princeton University and The University of Toronto. He currently teaches prisoners at a maximum-security prison in New Jersey.